This week's charts cover the period from January 7th to 13th. Playgendary took top spot on the App Store free download charts for the week with Polysphere, usurping 101 Digital's Color Bump 3D. The latter title however kept its position at the summit of the Google Play marketplace. Voodoo had four games in the App Store top 10, including new entry Grass Cut in ninth. It had just the one game, Fire Balls 3D in 10th, on Google Play. King's Candy Crush Saga sat atop both the App Store and Google Play top grossing charts. Supercell's Brawl Stars rose to eighth on iOS, just above Pokemon Go and DoubleDown Casino, but failed to reach the top 10 on Android. Color Bump 3D fended off Playgendary's challenge in the UK by holding onto top spot across the marketplaces' free download rankings. Sony was the big new entry in sixth on the App Store with Millionaire Trivia. 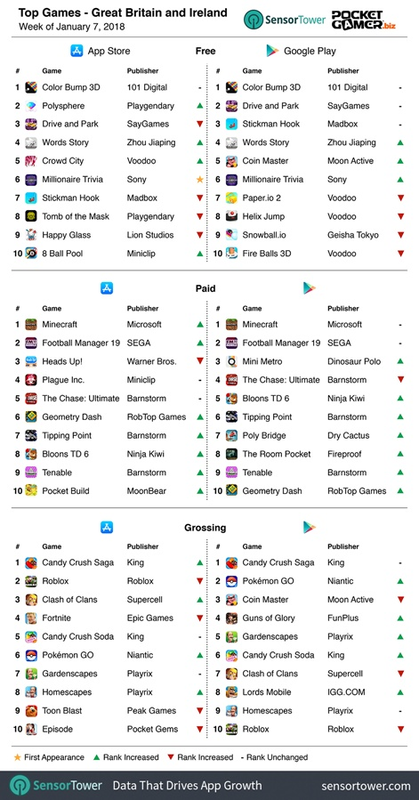 Much like the US, Candy Crush Saga took top spots across the iOS and Android grossing charts. 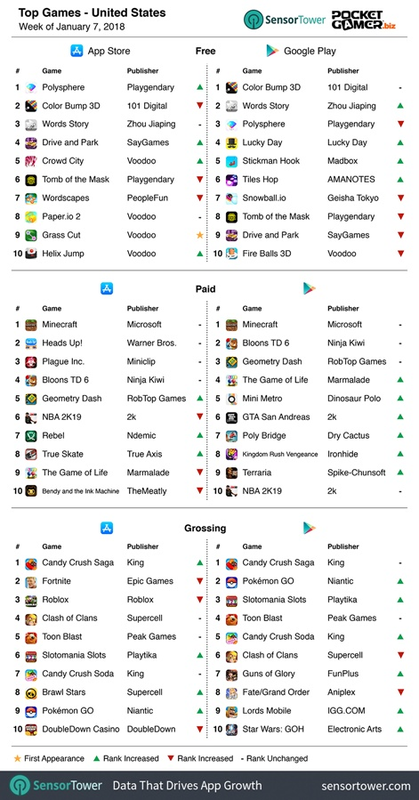 Fortnite fell to fourth on the App Store, behind Clash of Clans and Roblox. Playrix and King were the week's big winners with both companies getting two games into the top 10 grossing rankings on iOS. Tencent's PUBG Mobile was once again the most downloaded mobile game on the App Store in China, fending off a challenge from newcomer Party.io, which came in at second. 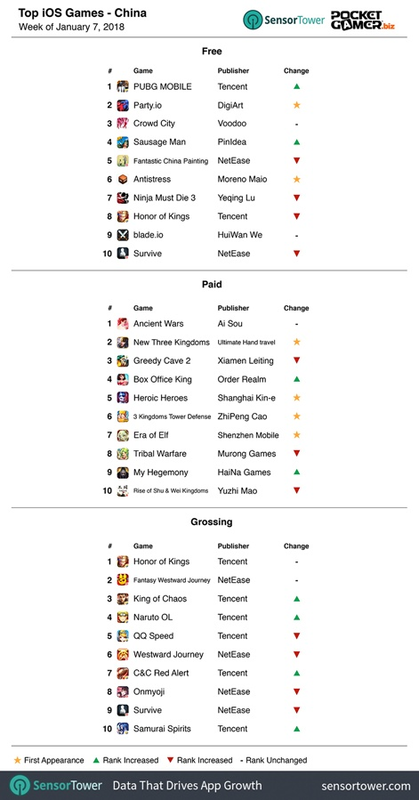 Tencent and NetEase took all of the top 10 slots in the grossing chart. with Honor of Kings and Fantasy Westward Journey once again unmoved in first and second.